In the new book, “A Team of Leaders: Empowering Every Member to Take Ownership, Demonstrate Initiative, and Deliver Results,” co-authors Paul Gustavson and Stewart Liff reflect on some of the bleak employee satisfaction and engagement levels that persist in organizations today, while noting that companies continue to spend billions of dollars on training and development—the majority of which is devoted to supervisory development. The statistics, they believe, point to the real issue in companies today: the way work is designed. Gustavson, a Herrmann HBDI® Practitioner and recipient of the Herrmann International “Big Thinker” Award, explains that people want to use their entire brains, not just the small part they use to follow orders. The book, which was rated by Soundview Executive Book Summaries as one of the “Top 30 Business Books for 2014,” discusses the critical, often overlooked role of thinking preferences in employee engagement, energy and enthusiasm as well as how diverse thinking contributes to a team’s productivity and performance. Gustavson has used the Whole Brain® System for more than 30 years in his work as an organizational design consultant and the founder of Organization Planning & Design, Inc. (OPD), and believes it is an essential component for building high-performing teams. 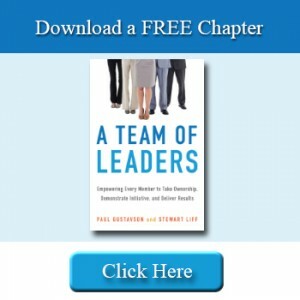 To learn more about the book and download a free chapter, visit A Team of Leaders. In the 2012 SHRM Survey on Employee Satisfaction and Engagement, only one out of every two employees reported that they were completely plugged in at work. Imagine how much productivity is being lost under these circumstances! Meanwhile, ASTD reported that U.S. organizations spent over $156 billion on learning and development in 2011, with the largest percentage devoted to supervisory development. These statistics are clearly distressing and point to what we believe is the root cause: the way work is designed. Simply put, as long as organizations continue to use a structure where the supervisor is the boss and everyone else follows, people will feel devalued and disconnected, supervisors will struggle and performance will suffer. That is because under this design, everything falls on the supervisor’s shoulders. The supervisor is under constant pressure to perform, makes all of the key decisions, interacts one-one with all of the employees, deals with the difficult people issues, etc. Meanwhile, the employees are expected to do what they are told, feel like they are merely cogs in the wheel, have little authority, autonomy or the chance to be creative, resulting in half feeling disengaged. It’s a classic “lose-lose” situation. To have an organization where the employees are involved, engaged and well developed, allowing the supervisor to be freed up to focus on higher-level work, you need to create a team of leaders. This design has been used in a variety of industries with a great deal of success at every level. It addresses many of the design flaws that the traditional structure has because there is no longer one “all-knowing” boss. Instead, everyone serves as a leader and is involved in all phases of the operation including planning, execution, training, scheduling, and even discipline. 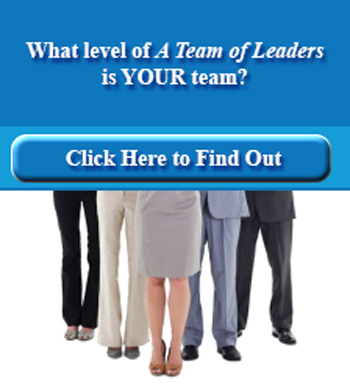 The official leader now serves as an advisor to the team and focuses his or her energy in other areas. As you can see, the most positive scores generally centered on the work itself and the employees’ desire to do whatever it takes to improve things. The one exception here is the AWS program, which people appreciated for the flexibility it provided them. Interestingly, all of these low ratings relate to something their supervisors did or did not do. In other words, from the viewpoint of Federal employees, they are most dissatisfied by the actions of their supervisors, meaning if they were to supervise more effectively, the employees theoretically would be more satisfied with their working conditions. Overall, only 43% reported that their leaders generate high levels of motivation and commitment and only 52% thought there was a results oriented culture. All in all, these numbers are pretty staggering, as only 2 in 5 employees are truly motivated and only 1 out of 2 feel the government’s culture values performance. A natural conclusion to draw from these statistics is that the way government managers deal with their employees is what most drives morale and more importantly performance. One approach to address this huge problem is to change the way that these officials manage. Of course, that would require an enormous amount of training and in many cases retraining the government’s hundreds of thousands of supervisors. It would also require removing those supervisors who aren’t effective and are either unwilling or unable to develop the requisite skill sets. Interestingly, the government’s current supervisors do not believe that the government does an effective job in dealing with its problem supervisors. Given the fact that the Federal government has been struggling to address this issue for decades, without much success, perhaps training is not the only answer. Maybe it is time to take a different approach. The new book, A Team of Leaders: Empowering Every Member to Take Ownership, Demonstrate Initiative, and Deliver Results, by Paul Gustavson and Stewart Liff, AMACOM Books, March 26, 2014, offers a new and exciting way forward. The idea behind the book is that organizations with the traditional top-down, supervisor-to-employee work structure, struggle with the inherent nature of this design. From the supervisor’s perspective, there is pressure to perform, frequent demands on their time, problem employees to address and unions to deal with. Moreover, they are required to make all of the key decisions and the weight of the world seemingly rests on their shoulders.